We have a number of Daytona machines and parts on sale / clearance. Full working machines, project machines, cabinet shells, daytona control panels, shifters, motorised assemblies and more. 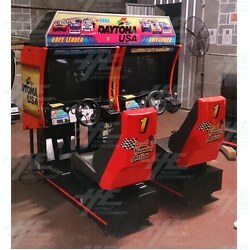 We have fully working Daytona twins in our showroom Newcastle, in Melbourne, and also in Perth. We also have 6x Daytona twins in various condition for clearance, as well as full control panels, stickers, etc..
To view all daytona items in stock, please follow this link.